This large town in northwestern Umbria is 30 kilometers north of Perugia and sits at the point where the Reggia flows into the Tiber River. Umbertide, one of Umbria’s largest towns, is of ancient origin, dating back to the 6th century BC. 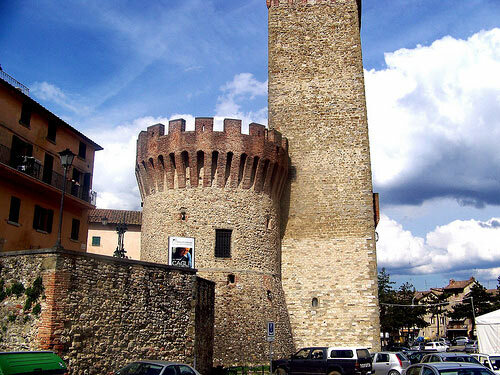 Although there are some remains of the medieval walls left, a few medieval houses, and part of the Rocca, or citadel, many of Umbertide’s best monuments are of later periods. Unfortunately the town suffered severe destruction during World War 2, and is now considered an industrial town producing machine tools, farm machinery, ceramics and other products. How To Get To Umbertide – Umbertide is on the E45 highway, 30km north of Perugia and 20km south of Città di Castello. There are also train connections via Perugia. What To See In Umbertide – Unlike most Umbrian cities which are hill towns, Umbertide lies on flat land. Despite the destruction it suffered during the war, there are still some interesting buildings which survived. Northwest of the town center overlooking Piazza Mazzini sits the remains of La Rocca, a fortress built in 1385 to help protect the Tiber River. It is in the middle of the historical center and contains an Exhibition of Contemporary Art. The Chiesa di Santa Maria della Reggia, is often also referred to as the Collegiata. It is an octagonal 16th century brick building topped by a cupola designed by Galeazzo Alessi and Giulio Danti. It also houses a few paintings by Pomarancio. The Chiesa di S. Maria della Pietà can be found by taking short detour to the northern part of town just outside the walls. It is of late medieval and Renaissance styles, and has a lunette above the doorway adorned with a fresco attributed to Pinturicchio or Bartolomeo Caporali. Within Chiesa di Santa Croce, a baroque church in Piazza San Francesca one can find Santa Croce Museum. Open Fridays, Saturdays and Sundays 10.30-13.00 and 15.00-17.30. Afternoon hours are one hour later in the summer. The museum is most famous for the painting Deposition of the Cross by Luca Signorelli (1516), and there is also a Madonna and Child by Niccolò Circignani (known as Pomarancio). Important Festivals – One of the most important festivals in Umbertide takes place in the month of September and is called the “Fratta dell’800′. It involves the historical reconstruction of events, shows and cooking of the XIXth century, and takes place every year in the old town. This festival is to commemorate the annexation of Umbertide to the Reign of Italy.